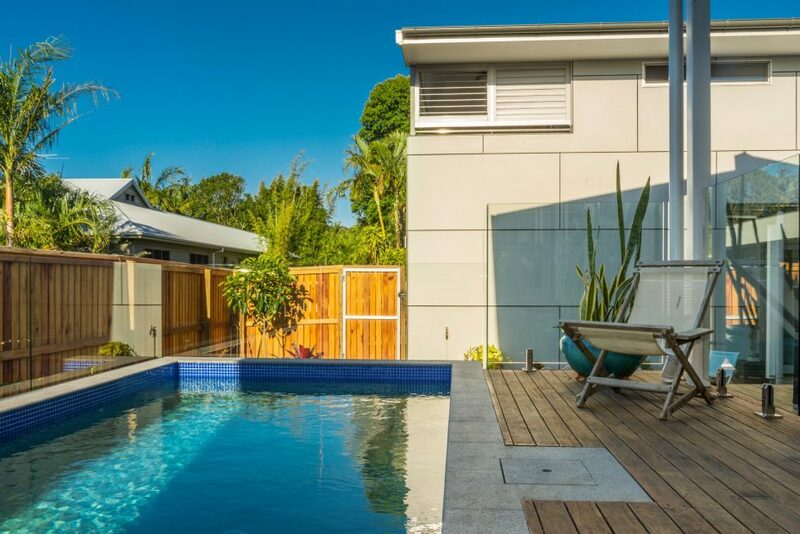 Byron Bay Holiday House with swimming pool in central location. 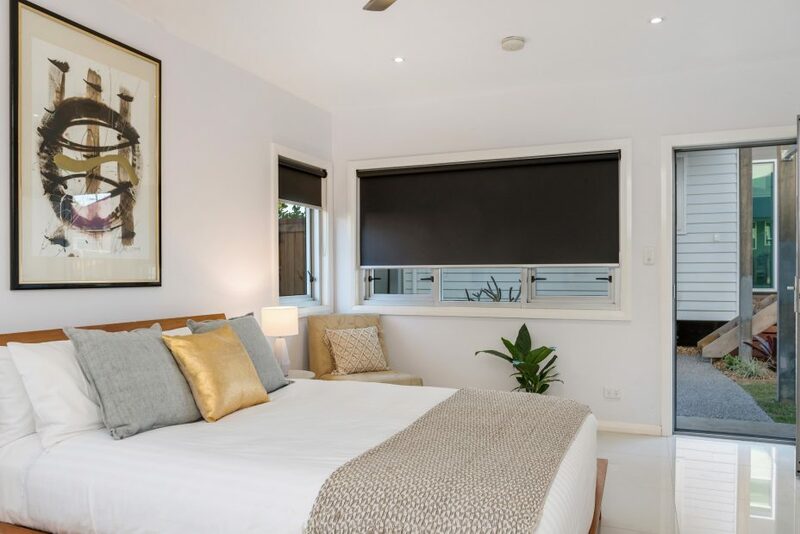 Live like a local at this Byron Bay holiday rental, which has been fully restored and includes a fully fenced garden, off-street parking and gorgeous private pool. 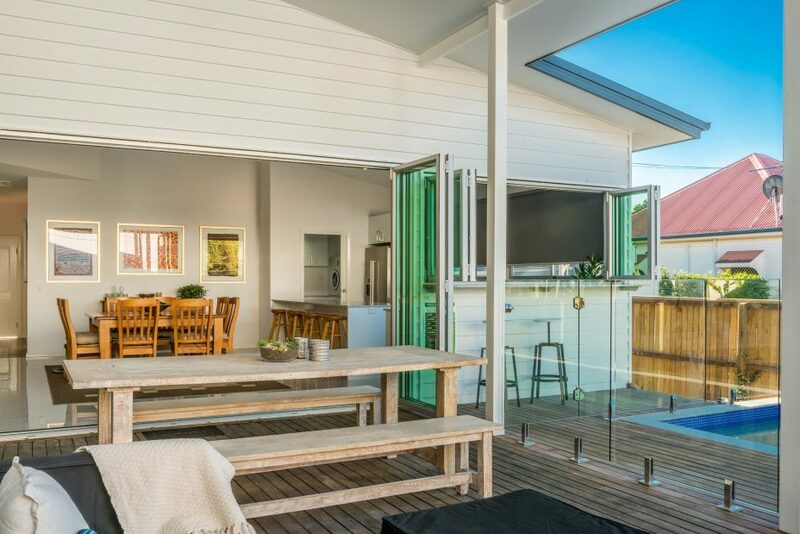 Watch the world go by from the front verandah, sip that first coffee from the swish espresso machine and listen to your favourite playlist courtesy of the Bose Sound link. 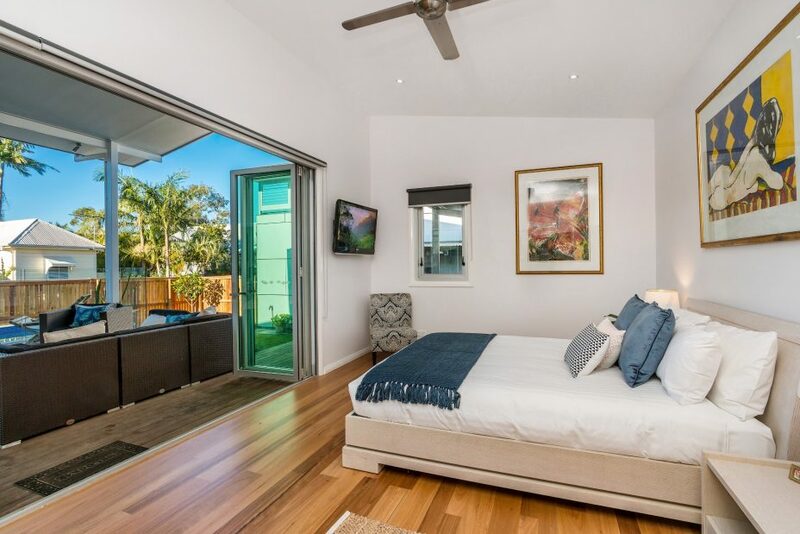 This charming Byron Bay beach house has 4 bedrooms and 4 bathrooms in the main house and studio. 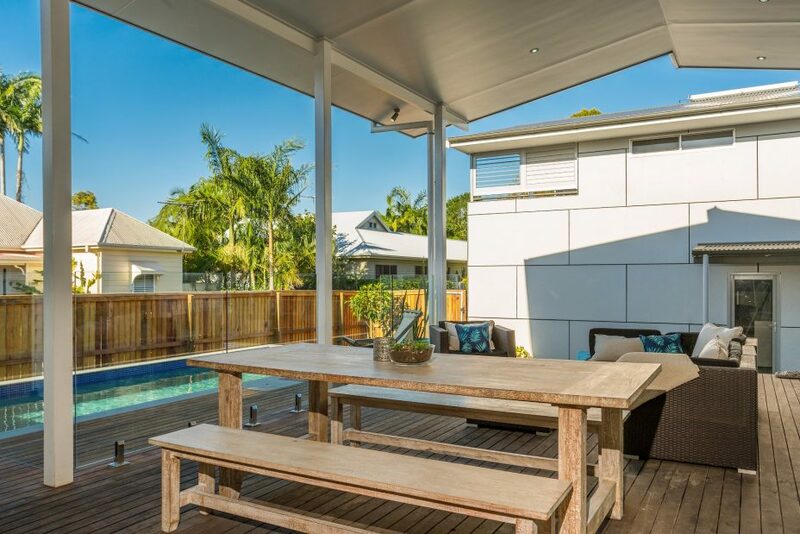 It’s ideal for 8 guests to relax on the deck overlooking the pool. 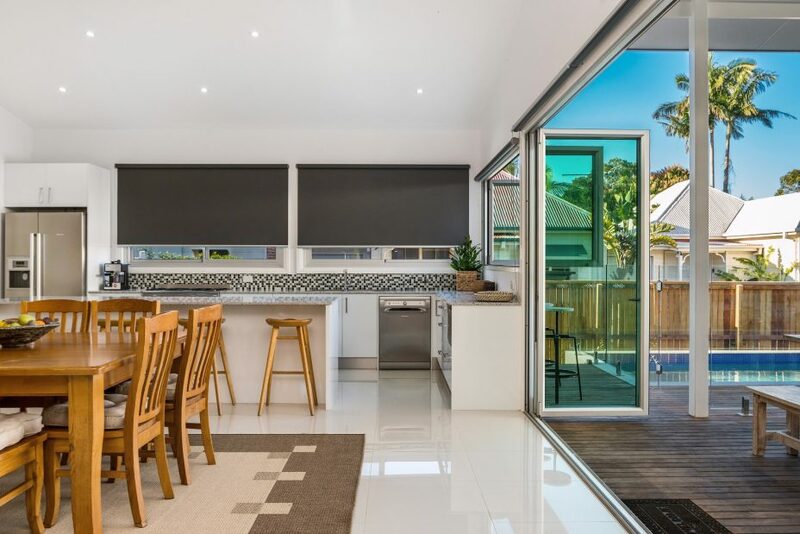 The air-conditioned open-plan living/kitchen area has lofty ceilings and fully retractable doors providing a seamless flow for indoor-outdoor living. 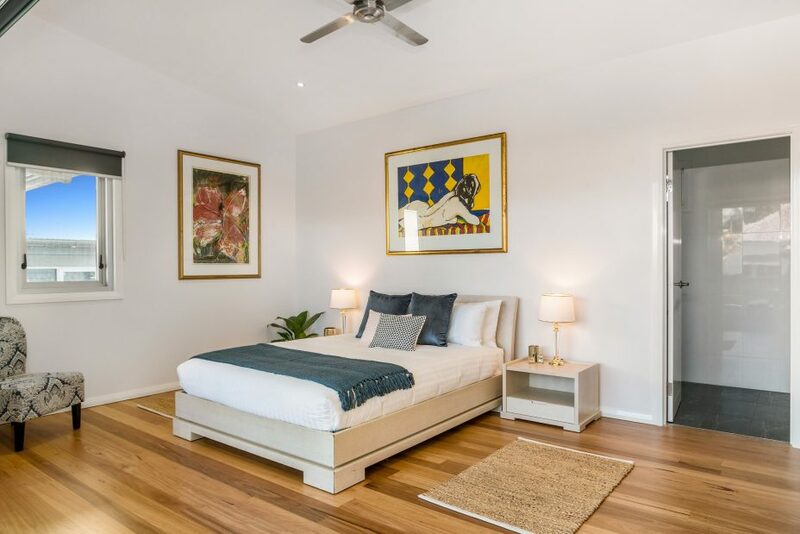 Bedrooms feature polished wood flooring, white walls and high ceilings with fans. It’s where historic charm meets beach retreat! 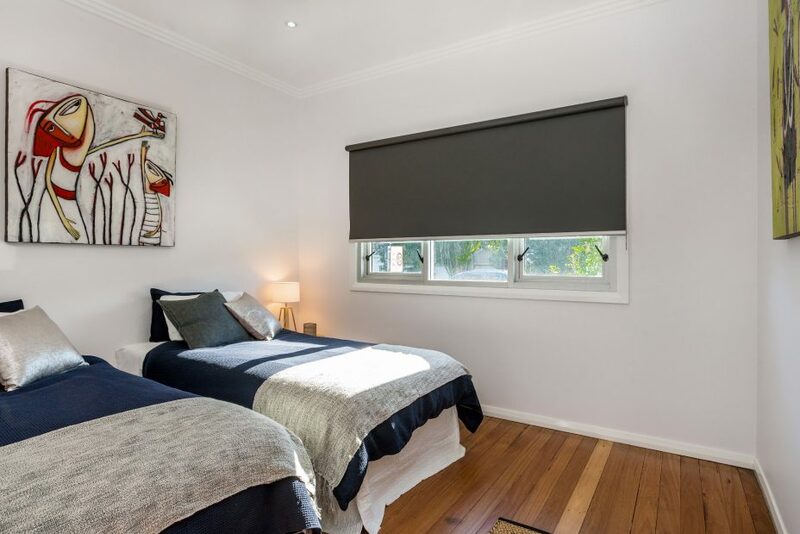 Set in a prime location in the heart of Byron Bay, Aditi holiday cottage is close to independent shops, quirky cafés and restaurants. The Local Grocer next door is a foodie paradise for stocking the refrigerator and you’ll find bo-ho chic designer beachwear at the nearby Spell & the Gypsy Collective. Sandy beaches and surfing are just 1km away along with the famous lighthouse and unspoiled Arakwal National Park. 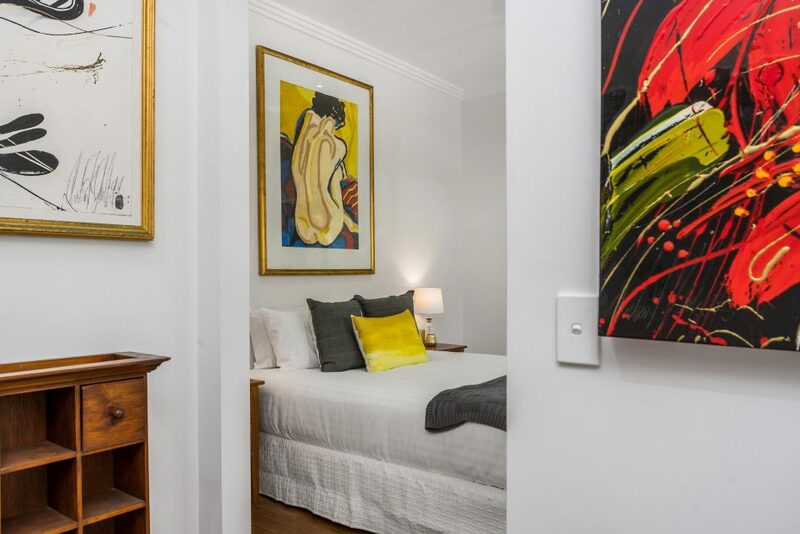 All bedrooms are spacious with modern artworks, polished wooden floors, white decor and ceiling fans. 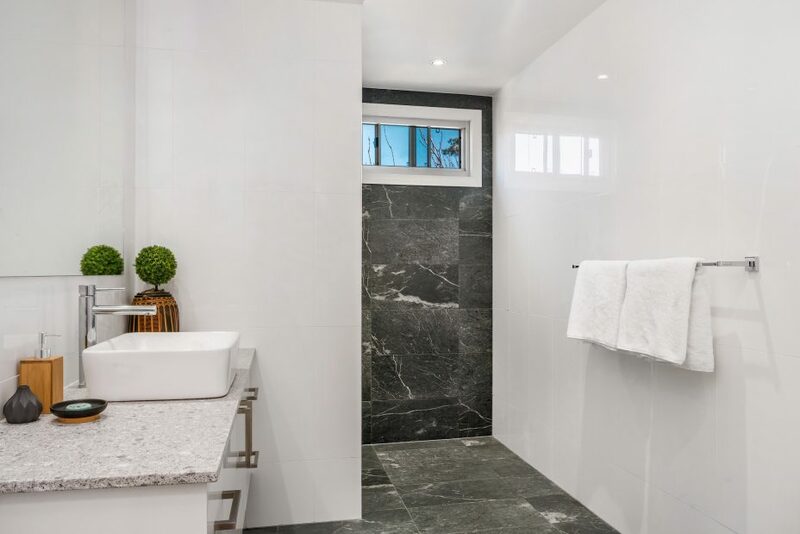 The main house has 2 ensuite bathrooms (master ensuite has a bath) plus a shared family bathroom. 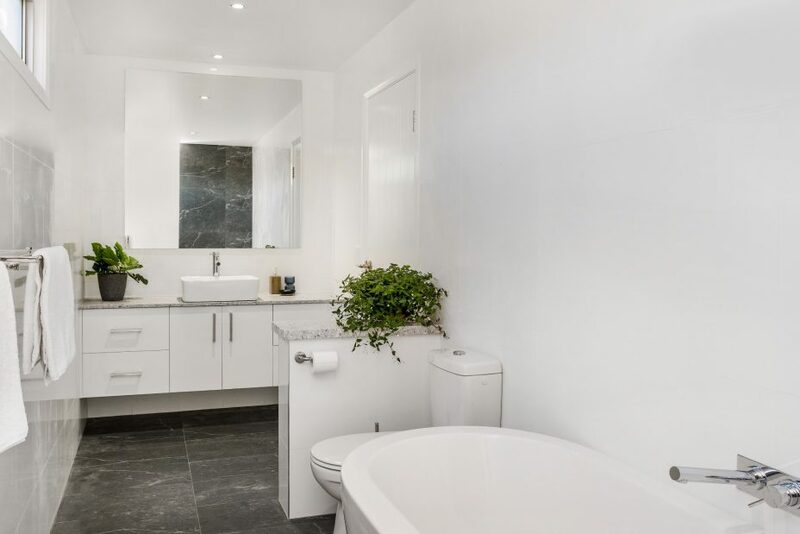 There is a further ensuite bathroom in the studio. 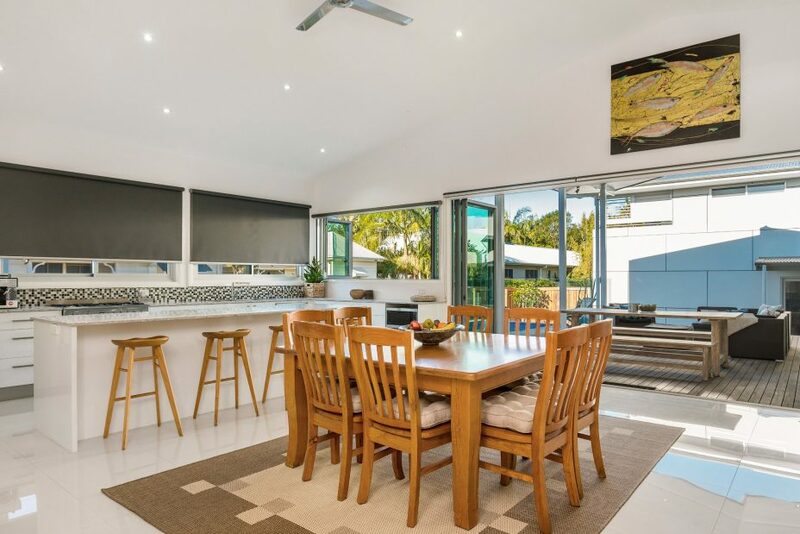 Enjoy the alfresco lifestyle with a BBQ in the private fenced yard. The outdoor lap pool provides a focal point near the covered deck area. 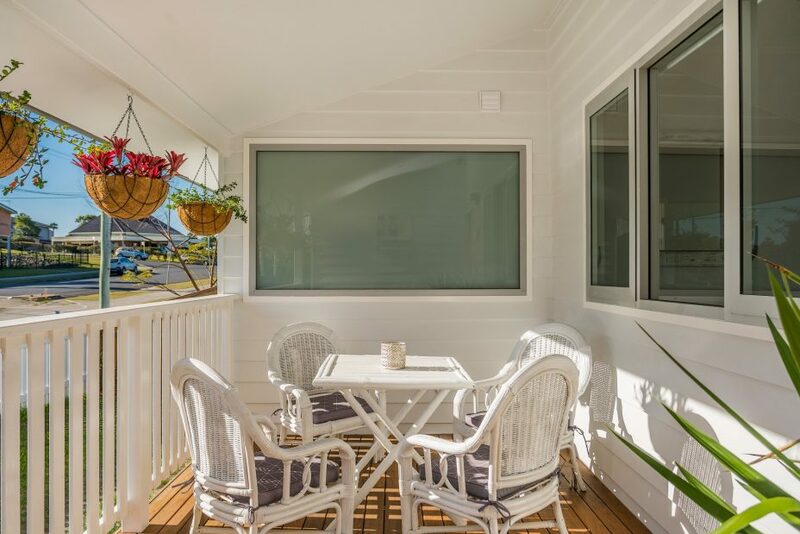 The front verandah provides a quiet place to read or watch the world go by. 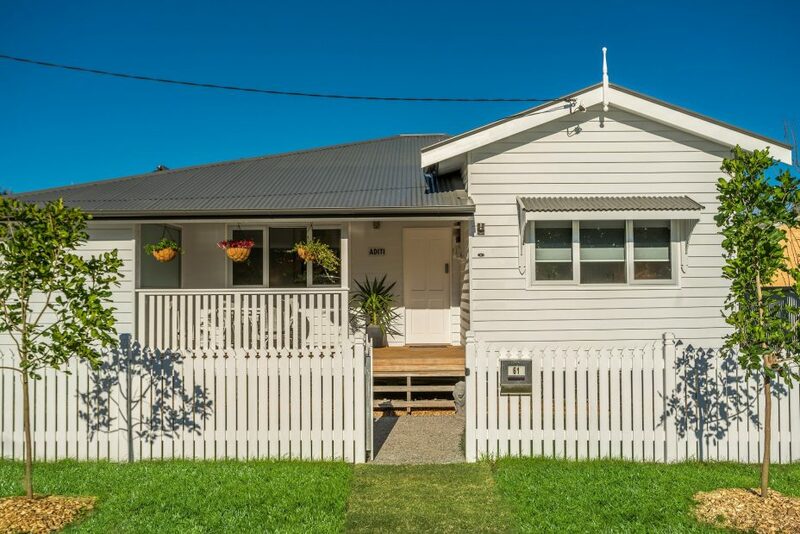 Centrally located in the heart of Byron town, this renovated cottage is next door to the famous Green Garage, a food store known for its local produce and tasty treats. Main Street is lined with cafés, ice cream parlours, shops and eateries just minutes away. 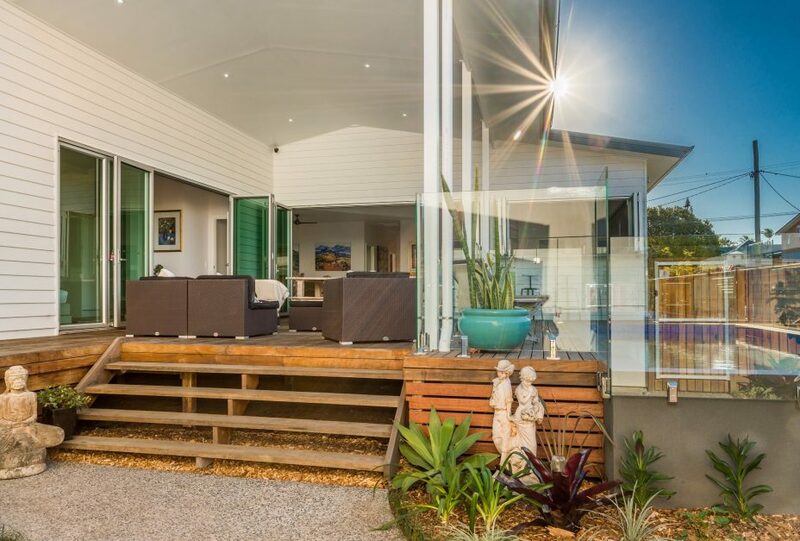 Byron Bay beaches are 1km from your Holiday cottage with golden sands, rolling surf and coastal walks within sight of the famous lighthouse. Hike up to the lighthouse for stunning views or whale watching, a popular pastime for visitors between May and October. Group restrictions – maximum of 8 adults at the property.